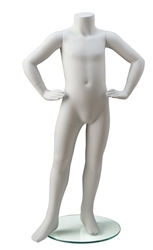 This 8 year old bendable mannequin can take any shape. Place him anywhere in a retail store doing any activity whatsoever, and he will look perfect doing it. Total design flexibility is built into this form. High quality jersey covered soft foam and pin-able as needed. 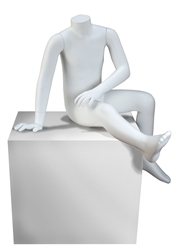 Comes with head as well as round nickel neck cap - either can be used, interchangeable based on your display needs. Also included is a hanging loop for the neck and a base stand. 47" Tall with head, 41" tall no head, Bust 21.5", Waist 19", Hip 22.5", Head Circum. 20"